According to research from the University of Cincinnati, the famously fuzzy relatives of elephants liked living in Greater Cincinnati long before it was trendy – at the end of the last ice age. A study led by Brooke Crowley, an assistant professor of geology and anthropology, shows the ancient proboscideans enjoyed the area so much they likely were year-round residents and not nomadic migrants as previously thought. They even had their own preferred hangouts. Crowley's findings indicate each species kept to separate areas based on availability of favored foods here at the southern edge of the Last Glacial Maximum's major ice sheet. "I suspect that this was a pretty nice place to live, relatively speaking," Crowley says. "Our data suggest that animals probably had what they needed to survive here year-round." Could the past save the future? 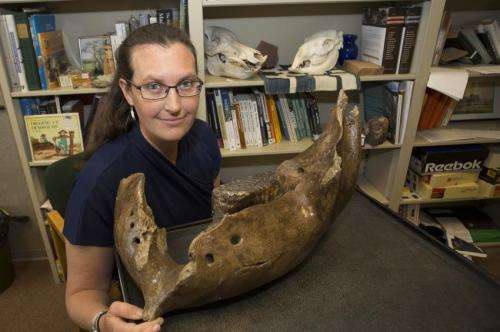 Crowley's research with co-author and recent UC graduate Eric Baumann, "Stable Isotopes Reveal Ecological Differences Among Now-Extinct Proboscideans from the Cincinnati Region, USA," was recently published in Boreas, an international academic research journal. Learning more about the different behaviors of these prehistoric creatures could benefit their modern-day cousins, African and Asian elephants. Both types are on the World Wildlife Fund's endangered species list. Studying how variable different types of elephants might have been in the past, Crowley says, might help ongoing efforts to protect these largest of land mammals from continued threats such as poaching and habitat destruction. "There are regionally different stories going on," Crowley says. "There's not one overarching theme that we can say about a mammoth or a mastodon. And that's becoming more obvious in studies people are doing in different places. A mammoth in Florida did not behave the same as one in New York, Wyoming, California, Mexico or Ohio." For their research, Crowley and Baumann looked to the wisdom in teeth – specifically museum specimens of molars from four mastodons and eight mammoths from Southwestern Ohio and Northwestern Kentucky. Much can be revealed by carefully drilling a tooth's surface and analyzing the stable carbon, oxygen and strontium isotopic signatures in the powdered enamel. "Strontium reflects the bedrock geology of a location," Crowley says. 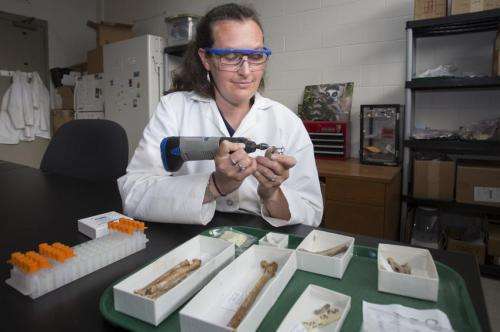 "So if a local animal grows its tooth and mineralizes it locally and dies locally, the strontium isotope ratio in its tooth will reflect the place where it lived and died. If an animal grows its tooth in one place and then moves elsewhere, the strontium in its tooth is going to reflect where it came from, not where it died." Mammoths ate more grasses and sedges than mastodons, which favored leaves from trees or shrubs. Strontium from all of the animals (except one mastodon) matched local water samples, meaning they likely were less mobile and migratory than previously thought. Differences in strontium and carbon between mammoths and mastodons suggest they didn't inhabit the same localities. Mammoths preferred to be closer to the retreating ice sheet where grasses were more abundant, whereas mastodons fed farther from the ice sheet in more forested habitat. "As a geologist, questioning the past is one of the most interesting and exciting things to do," says Baumann, an environmental geologist with a contractor for the U.S. Environmental Protection Agency. "Based on our data, mammoths and mastodons seemed to have different diets and lived in different areas during their lives. This is important because it allows us to understand how species in the past lived and interacted. And the past is the key to the present." Crowley of the McMicken College of Arts and Sciences plans further research into how strontium isotopes can be used to explore megafauna, including other projects dealing with mammoths and mastodons.